With their seasons drawing to a close as the weather gets colder, Pitt’s club sports teams are ramping up their games in preparation for their final tournaments. 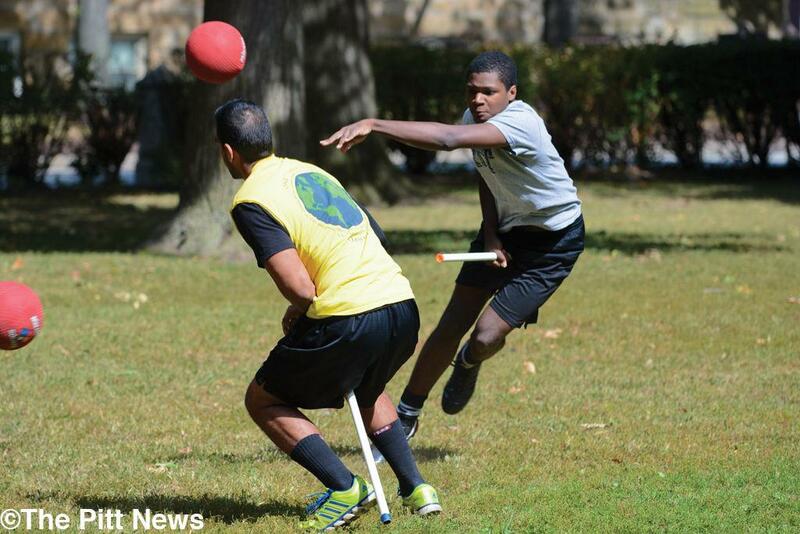 “Qualifying for world cup gets harder every year since the sport is rapidly growing internationally,” Kimaya Padgaonkar, a chaser on the Pitt Quidditch team, said. Once a fictional sport occurring within the pages of J.K. Rowling’s Harry Potter series, Quidditch has been adapted to fit the needs of non-magically inclined muggles. Seven players — three chasers, two beaters, one keeper and one seeker — run around on a field with broomsticks between their legs using quaffles (deflated volleyballs) to score points through hoops and bludgers (dodgeballs) to knock members of the opposing team out of play until they touch one of their goals. The keepers stand guard near the hoops to deflect any oncoming quaffles. While this is going on, the seeker tries to catch the snitch, a tennis ball attached to the snitch runner’s shorts. Capturing the snitch nets the team 30 points and ends the game. Last year, Pitt Quidditch made it to nationals — referred to as the World Cup among players — but didn’t make it past group play. This year, regionals are Nov. 1 and Nov. 2, and the top 10 finishers earn a trip to the World Cup. The Panthers expect to make a run at another World Cup appearance. The team practices Friday evenings from 5 to 7 p.m. and Sunday from 11 a.m. to 1 p.m. They participate in beater drills and chaser drills, which are followed by a team scrimmage, during which they go through game strategies. Pitt Rowing Club decided to jump three years ago from race fours (4+), which consist of four rowers and a coxswain, to race eights (8+) because it is considered the more prestigious type of racing. Because of the switch, it took the team some time to get back up to the competing level. Last year, the women’s team first entry in the 8+ category advanced all the way to the Grand Finals for the American Collegiate Rowing Association (ACRA) spring championship regatta. The Varsity Men’s 4+ team took eighth place at the Head of the Charles Regatta, the largest rowing event where teams from all over the world come to compete. “We believe that this will be our most competitive year thus far,” Chris Garver, a rower for the Pitt Rowing Club, said. This year, both teams will be entering the 8+ category when they make their way back to the Head of the Charles competition. To prepare for the tournaments, the club team practices Monday through Saturday, with varsity starting at 5:30 a.m. and freshmen at 5:30 p.m. Varsity and freshmen rowers practice together on Saturdays at 7 a.m.